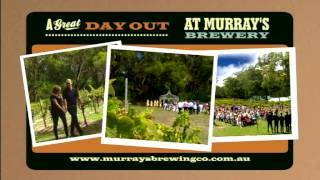 Murray’s Craft Brewing Co. shares its home with Port Stephens Winery, on 14 hectares of beautiful vineyards in Port Stephens, north of Sydney. You’ll enjoy a wide range of locally produced beers and wines in one convenient location. Visitors will savour many taste sensations. The Brewery Restaurant offers delicious meals with matching beers and wines. The cellar door has up to 20 different local and regional wines. A huge range of craft beers on offer includes the popular Whale Ale. You can even play a game of bocce on an outdoor court. There’s plenty of space for children to run around and play, too. Brewery and winery tours are daily at 2pm. From Sydney, the drive to Murray’s, near Nelson Bay on the North Coast of NSW, is 2 h 20 min. You can take a train from Sydney to Newcastle for a bus to Nelson Bay. A weekend shuttle service from Nelson Bay is available. Reservations for the shuttle service are essential.